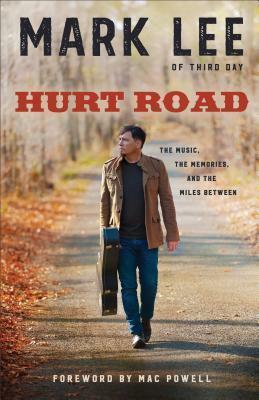 Hurt Road: The Music, the Memories, and the Miles Between by Mark Lee and Mac Powell was published on September 5th, 2017 by Fleming H. Revell Company. Third Day guitarist Mark Lee is no stranger to heartache and hopes deferred; the road to success is never traveled without missteps along the way. Life is messy and uncertain and full of surprises. And one of the best things he’s ever done is let go of his expectations about how life should be in order to embrace life as it is a moment-by-moment walk with God.Hurt Road is the engaging true story of a man who, as a teen, found in music a refuge from the uncertainties of life. Who set out to discover a better way to live than constantly struggling to make sure life turned out the way he planned it. Who stopped substituting what’s next for what’s now and learned the truth–that coming or going, God’s got us. Poignant, funny, and thoughtful, Hurt Road dares anyone feeling knocked down or run over by their circumstances to give up control to the One who already has the road all mapped out. Includes black and white photos. About the author: Mark Lee is a founding member and guitarist for the award-winning Christian rock band Third Day, with 13 albums and total sales approaching 8 million. An accomplished songwriter (“Sky Falls Down,” “Alien,” “Show Me Your Glory,” and more), Lee has also written for CCM Magazine, Guideposts for Teens, and others. While balancing touring with life as a husband and father, he earned his BA in Christian studies from Grand Canyon University. He lives with his family outside Atlanta, Georgia. My thoughts: I found this book to be a quick read that is full of stories about Lee’s life and lessons he learned along the way. In this book, he shares the highs and lows of those lessons. He writes about how he turned the negatives into learning opportunities. This book does not focus much on the band (Third Day) but more on Lee’s life. I enjoyed reading this book that is full of scripture, tender moments, his music career, and how God had a hand in it all. Overall a very inspiring read.